This five day workshop offers an exciting opportunity to immerse yourself in the art of monotype printmaking, in other words making one-off pieces using printmaking techniques. It will cover key technical aspects, but importantly, will also focus on using these creatively. It will be suitable for complete newcomers to printmaking or those with some experience looking to broaden their range. While some previous artistic practice would be helpful, anyone who wishes a truly creative, enjoyable experience in a delightful environment is very welcome. Art and design teachers and students would benefit from it very much. 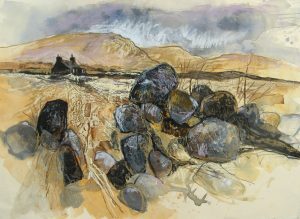 The workshop will introduce a range of printmaking techniques suitable for practising at home, then look at integrating these within a wider mixed media approach. An introduction to the wealth of possibilities afforded by printmaking will help you to create unique works through the combination of monotype, collagraph, collage, drawing, painting and more. A printing press may be available if there is a strong desire among the group to try one out, but the workshop will focus primarily on lo-tech methods which can easily be used at home without specialist equipment. The program will be very open with lots of time to experiment and allow each participant’s individual style to dictate the direction of the workshop.